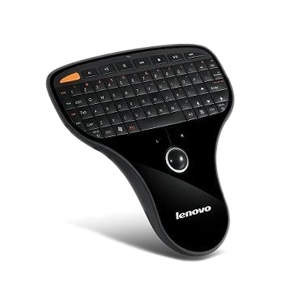 The Lenovo N5901 wireless keyboard is a small handheld remote with a full QWERTY keyboard and built-in trackball. It seems well suited for home theater (HTPC) applications, however, it has a number of drawbacks. The first, and most noticeable, is that in the home theater environment, there is a desire to control light levels, so it is typically pretty dark. The keyboard on this remote is not backlit, so it is impossible to type on it in the dark. Touch typing is not an option either, as the remote is too small and must be held in your hands. Other annoyances include the fact that the keyboard has a power switch rather than being smart enough to power itself off when idle. So this means if you forget to power it off, it will sit all night with the trackball LED illuminated until the batteries go dead. I’ve also had some issues with the purported 30 foot range on this remote, which is surprising, since I plugged the USB receiver into the front of my HTPC and I am sitting less than 5 feet from it. But I still find it necessary to hold the remote up in the air slightly for the signal to transmit. Overall, I am not pleased with this offering (glad I only paid half price for it), and will continue looking for better alternatives, as I await the release of the Boxee Remote around Christmas time.